Maine Lighthouse Museum. Rockland, Maine. Marinas.com. Photos of Maine lighthouses. Maine Lighthouses. The Lighthouse People. 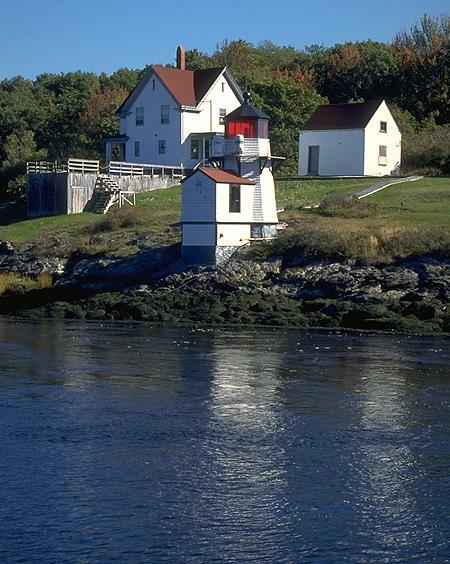 New England Lighthouses: A Virtual Tour. Baker Island Light. NE Lighthouses Virtual Guide. The Baker Island Light. By cranberryisles.com. Baker Island Light. National Park Service. Photo of Baker Island Lighthouse. Marinas.com. Bass Harbor Lighthouse. NE Lighthouses Virtual Guide. Photo of Bass Harbor Lighthouse. Marinas.com. Bass Harbor Head, ME. LighthouseFriends.com. Bass Harbor Light. Google Satellite View. Bass Harbor Head Light. AcadiaMagic.com. Bear Island Lighthouse, Northeast Harbor, Maine. Bear Island Lighthouse. NE Lighthouses Virtual Guide. Photo of Bear Island Lighthouse. Marinas.com. Blue Hill Bay Light, Brooklin, Maine. Blue Hill Bay Lighthouse. NE Lighthouses Virtual Guide. Boon Island Lighthouse, York, Maine. Boon Island Lighthouse. NE Lighthouses Virtual Guide. Photo of Boon Island Lighthouse. Marinas.com. Read a story about cannibals on Boon Island. See the July 5, 2010 news article below. The Boon Island Lighthouse was sold by the General Services Administration to Art Giruad of Portland, Maine for $78,000 in September 2014. 1. As of September 2014 it was still active as a navigational aid. Brown's Head Light, Vinalhaven Island, Maine. Browns Head Light. National Park Service. Brown's Head Light. NE Lighthouse Virtual Guide. Photo of Brown's Head Light. Marinas.com. Burnt Coat Harbor Lighthouse, Boothbay Harbor, Maine. Burnt Coat Harbor Light. NE Lighthouses Virtual Guide. Photo of Burnt Coat Harbor Lighthouse. Marinas.com. Burnt Island Light Station, Boothbay Harbor, Maine. Burnt Island. Maine Department of Marine Resources. Burnt Island Light. NE Lighthouses Virtual Guide. Photo of Burnt Island Light Station. Marinas.com. Cape Elizabeth Light, Cape Elizabeth, Maine. Cuckolds Island Light Station, Boothbay Harbor, Maine. Cuckolds Island Fog Signal and Light Station. Cuckolds Light. NE Lighthouses Virtual Guide. Photo of Cuckolds Lighthouse. Marinas.com. Curtis Island Lighthouse, Camden, Maine. Curtis Island Lighthouse. NE Lighthouses Virtual Guide. Photo of Curtis Island Lighthouse. Marinas.com. Deer Island Thorofare Lighthouse, Deer Island, Maine. Deer Island Thorofare Light. National Park Service. Deer Island Light. NE Lighthouses Virtual Guide. Photo of Deer Island Thorofare Lighthouse. Marinas.com. Dice Head Lighthouse, Castine, Maine. Dice Head Light. NE Lighthouses Virtual Guide. Photo of Dice Head Lighthouse. Marinas.com. Doubling Point Light, Arrowsic Island, Maine. Friends of the Doubling Point Light. Doubling Point Range Lights. National Park Service. Doubling Point Light. NE Lighthouses Virtual Guide. Eagle Island Lighthouse, Eagle Island, Maine. Eagle Island Lighthouse. NE Lighthouses Virtual Guide. Photo of Eagle Island Lighthouse. Marinas.com. Egg Rock Lighthouse, Winter Harbor, Maine. Egg Rock Light. NE Lighthouses Virtual Guide. Photo of Egg Rock Lighthouse. Marinas.com. Fort Point Lighthouse, Stockton Springs, Maine. Fort Point Light. NE Lighthouses Virtual Guide. Photo of Fort Point Lighthouse. Marinas.com. Franklin Island Lighthouse, Muscongus Bay, Maine. Franklin Island Light. NE Lighthouses Virtual Guide. Photo of Franklin Island Lighthouse. Marinas.com. Goat Island Lighthouse, Kennebunkport, Maine. Goat Island Light. NE Lighthouses Virtual Guide. Photo of Goat Island Lighthouse. Marinas.com. Goose Rocks Lighthouse, North Haven, Maine. Goose Rocks Light. NE Lighthouses Virtual Guide. Photo of Goose Rocks Lighthouse. Marinas.com. Great Duck Island Lighthouse, Frenchboro, Maine. Great Duck Island. NE Lighthouses Virtual Guide. Photo of Great Duck Island Lighthouse. Marinas.com. Great Duck Island. College of the Atlantic. Grindle Point Lighthouse, Islesboro, Maine. Grindle Point Light. NE Lighthouses Virtual Guide. Photo of Grindel Point Lighthouse. Marinas.com. Halfway Rock Lighthouse, South Harpswell, Maine. Halfway Rock Light. NE Lighthouses Virtual Guide. Photo of Halfway Rock Lighthouse. Marinas.com. Hendricks Head Light, West Southport, Maine. Hendricks Head Light. NE Lighthouses Virtual Guide. Heron Neck Lighthouse, Rockport, Maine. Heron Neck Light. NE Lighthouses Virtual Guide. Photo of Heron Neck Lighthouse. Marinas.com. Indian Island Lighthouse, Rockport, Maine. Indian Island Light. NE Lighthouses Virtual Guide. Photo of Indian Island Lighthouse. Marinas.com. Isle au Haut Light, Isle au Haut, Maine. Info on Isle au Haut, Maine. Travel-Maine.Info. Robinson Point Light. NE Lighthouses Virtual Guide. Photo of Isle au Haut. Marinas.com. Ladies Delight Light, Manchester, Maine. Lake Cobbosseecontte Light. NE Lighthouses Virtual Guide. Libby Island Lighthouse, Machiasport, Maine. Libby Island Light. NE Lighthouses Virtual Guide. Photo of Libby Island Lighthouse. Marinas.com. Little River Lighthouse, Cutler, Maine. Friends of Little River Lighthouse. American Lighthouse Foundation. Little River Light. NE Lighthouses Virtual Guide. Photo of Little River Lighthouse. Marinas.com. Photo of Little River Lighthouse. Bold Coast Charter Company. Lubec Channel Light, Lubec, Maine. Lubec Channel Light. NE Lighthouses Virtual Guide. Photo of Lubec Channel Light. Marinas.com. Machias Seal Island Lighthouse, Machias, Maine. Photo of Machias Seal Island Lighthouse. Marinas.com. Photo of Mark Island Lighthouse. Marinas.com. Marshal Point Lighthouse, Port Clyde, Maine. Marshall Point Light. NE Lighthouses Virtual Guide. Photo of Marshall Point Lighthouse. Marinas.com. Matinicus Island Light. NE Lighthouses Virtual Guide. Photo of Matinicus Island Lighthouse. Marinas.com. The Haunted Lighthouse of Matinicus. Photo of McHeard Cove Lighthouse. Marinas.com. Monhegan Lighthouse, Monhegan Island, Maine. Monhegan Island Light. NE Lighthouses Virtual Guide. Photo of Monhegan Lighthouse. Marinas.com. Moose Peak Light, Jonesport, Maine. Moose Peak Light. NE Lighthouses Virtual Guide. Photo of Moose Peak Light. Marinas.com. Mount Desert Rock Lighthouse, Frenchboro, Maine. Mount Desert Rock Light. NE Lighthouse Virtual Guide. Photo of Mount Desert Rock Lighthouse. Marinas.com. Nash Island Lighthouse, Addison, Maine. Nash Island Light. Maine Officer of Tourism. Nash Island Light. National Park Service. Nash Island Light. NE Lighthouses Virtual Guide. Photo of Nash Island Lighthouse. Marinas.com. Nash Island Lighthouse. The Great American Lighthouse Resource. Nubble Lighthouse, Cape Neddick, Maine. Nubble Light. NE Lighthouses Virtual Guide. Photo of Nubble Lighthouse. Marinas.com. Nubble Lighthouse Photo. By Downeast Magazine. Owl's Head Light. NE Lighthouses Virtual Guide. Photo of Owl's Head Lighthouse. Marinas.com. Photo of Peggys Island Lighthouse. Marinas.com. Pemaquid Point Lighthouse, Bristol, Maine. Pemaquid Point Lighthouse. American Lighthouse Foundation. Pemaquid Point Light. NE Lighthouses Virtual Guide. Photo of Pemiquid Point Lighthouse. Marinas.com. Pemaquid Point Live Cam. Pemaquid Point Association. Perkins Island Light Exhibit. Maine Lighthouse Museum. Perkins Island Light. NE Lighthouses Virtual Guide. Photo of Perkins Island Light. Marinas.com. Petit Manan Lighthouse, Corea, Maine. Petit Manan Light. NE Lighthouses Virtual Guide. Photo of Petit Manan Lighthouse. Marinas.com. Petit Manan Light. Google Satellite View. Pond Island Lighthouse, Popham Beach, Maine. Narraguagus Light. NE Lighthouses Virtual Guide. Photo of Pond Island Lighthouse. Marinas.com. Narraguagus (Pond Island), ME. LighthouseFriends.com. Pond Island Light. Google Satellite View. Portland Breakwater Light (Bug Light), South Portland, Maine. Portland Breakwater Light. NE Lighthouses Virtual Guide. Portland Head Light. NE Lighthouses Virtual Guide. Photo of Cape Elizabeth Lighthouse. Marinas.com. Photo of Portland Head Light. By Jim Salge, Flickr.com. Heroism and Bravery along the Maine Coast. Pub Talk. Prospect Harbor Light, Prospect Harbor, Maine. Prospect Harbor Light. NE Lighthouse Virtual Guide. Photo of Prospect Harbor Lighthouse. Marinas.com. Prospect Harbor Light. Google Satellite View. Pumpkin Island Lighthouse, Little Deer Isle, Maine. Pumpkin Island Light. NE Lighthouses Virtual Guide. Photo of Pumpkin Island Lighthouse. Marinas.com. Ram Island Ledge Light, Casco Bay, Maine. Ram Island Light. NE Lighthouses Virtual Guide. Photo of Ram Island Ledge Lighthouse. Marinas.com. Ram Island Ledge Light. lighthousegetaways.com. Friends of the Rockland Breakwater Lighthouse. Restoring a Maine Lighthouse. Rockland Breakwater Light. NE Lighthouses Virtual Guide. Photo of Rockland Harbor Breakwater Lighthouse. Marinas.com. Rockland Harbor Southwest Light, Owls Head, Maine. Rockland Harbor SW Light. NE Lighthouses Virtual Guide. Saddleback Ledge Light. NE Lighthouses Virtual Guide. Photo of Saddleback Ledge Light. Marinas.com. Seguin Island Lighthouse, Bath, Maine. Friends of Seguin Island Lighthouse. Seguin Island Light. NE Lighthouses Virtual Guide. Photo of Seguin Island Lighthouse. Marinas.com. Spring Point Ledge Lighthouse, South Portland, Maine. Spring Point Ledge Light. lighthousegetaway.com. Squirrel Point Light, Arrowsic, Maine. Squirrel Point Light. NE Lighthouses Virtual Guide. St. Croix River Light, Calais, Maine. St. Croix River Light. NE Lighthouses Virtual Guide. Tenants Harbor Light, St. George, Maine. Tenants Harbor Light. NE Lighthouse Virtual Guide. Two Bush Island Lighthouse, Spruce Head, Maine. Two Bush Island Light. NE Lighthouses Virtual Guide. Photo of Two Bush Island Lighthouse. Marinas.com. West Quoddy Head Lighthouse, Lubec, Maine. West Quoddy Head Light Keepers Association. West Quoddy Head Light. NE Lighthouses Virtual Guide. Photo of West Quoddy Head Lighthouse. Marinas.com. West Quoddy Head Light. lighthousegetaway.com. Whaleback Light. NE Lighthouses Virtual Guide. Whitehead Island Lighthouse, St. George, Maine. Whitehead Light. NE Lighthouses Virtual Guide. Photo of Whitehead Island Lighthouse. Marinas.com. Whitlocks Mill Lighthouse, Calais, Maine. Whitlock's Mill Lighthouse. St. Croix Historical Society. Whitlocks Mill Light. NE Lighthouses Virtual Guide. Photo of Whitlocks Mill Lighthouse. Marinas.com. Winter Harbor Lighthouse, Winter Harbor, Maine. Winter Harbor Light. NE Lighthouses Virtual Guide. Wood Island Lighthouse, Biddeford Pool, Maine. Wood Island Light. NE Lighthouses Virtual Guide. Photo of Wood Island Lighthouse. Marinas.com. New England Lighthouse Lovers (NELL). Schooner Mary Day. Lighthouse tours aboard a windjammer. Dan's Lighthouse Page. Different types of info on lighthouses. Lighthouses in Maine. A blog about Maine lighthouses. Lighthouse Digest. The magazine for lighthouse enthusiasts. Legendary Lighthouses of Maine. Public Broadcasting System (PBS). Maine Lighthouses Illustrated Map & Guide. Bella Terra Maps. an artist living in Oxford, Maine. October 13, 2011. "It's like a walk back in time". Goat Island Lighthouse. The Portland Herald Press. July 5, 2010. "Cannibals off the Coast of Maine". Boon Island Lighthouse. New England Folklore. July 4, 2010. "Maine lighthouse opening to public". Seacoast Online. May 13, 2009. "An inside look at Portland Head Light". WCSH6.com. October 29, 2009. "The ghost of Goat Island Light". Seacoastonline.com. September 15, 2009. "Costs dim the allure of storied beacons". Boston.com. September 9, 2009. "Lighthouse day a beacon to public". Bangor Daily News. September 8, 2009. "A rare glimpse inside the lights". Exploring Maine. August 12, 2009. "Marshall Point Lighthouse: A favorite Maine destination for Andrew Wyeth, Forrest Gump & travelers". Examiner.com. August 11, 2009. "Heroism and bravery along the Maine coast". Pub Talk. July 29, 2009. "How to Vacation in a Lighthouse". Offbeat Guides. March 10, 2009. "A Maine trip is all about lighthouses". The Portland Press Herald. July 27, 2008. "A Quick Visit to Maine". (Where to buy maps of Maine's lighthouses). Bella Terra Maps Blog. October 21, 2008. "Last One Dollar Lighthouses For This Year". Lighthouse News. May 27, 2008. "Sunset Cruise to Benefit Lighthouse Preservation". MaineBusiness.com. April 19, 2008. "Spring Point Ledge Lighthouse Offering Corporate Sponsorships". Lighthouse News. March 12, 2008. "Close to Home: Lighthouse getaway". Portland Press Herald. 1. For more on the sale of the Boon Island Light Station see "Portland Man Buys New England's Tallest Lighthouse", MPBN News, September 3, 2014 at this link.